On the heels of the Company’s entrance into the U.K., this transaction creates a formidable executive team and dedicated base of operations in the region for hotel owners and investors, fully supported by Interstate’s industry-leading systems. The Company’s U.K. team will be complemented with Chardon’s high quality, knowledgeable executives and associates led by Interstate Europe’s Managing Director for the U.K., Robert Crook who will be reporting to Ken McLaren, Interstate’s executive vice president of international operations, further strengthening Interstate’s insight and ability in the market. “With this acquisition, we believe Interstate is now established as the preeminent hotel management company in the U.K. and Irish markets, offering institutional and private investors a world class hotel management platform,” said Jim Abrahamson, chief executive officer of Interstate Hotels & Resorts. “As our second U.K. acquisition this year, we will leverage Interstate’s on-the-ground operations and tangible experience in the country to successfully transition and operate this new portfolio, generating increased profitability for owners, while maximizing asset values.” Chardon Management’s portfolio includes 32 hotels with 3,414 rooms, consisting of Holiday Inn Express and Holiday Inn branded hotels in addition to Hotel Indigo, Best Western, Choice, Ibis Styles and independent hotel brands. “Interstate is a recognized world leader and brings 50 years of industry experience, dynamic relationships with quality brands and international experience to the table,” said Nicola Taylor, Director at Chardon Management who will now serve in an advisory capacity. “Chardon’s relationship with Interstate ensures a really successful future, providing our staff, owners, investors, associates, and ultimately our guests with the best experience possible in the U.K. and Ireland hospitality industry.” “Chardon is one of the most esteemed independent management companies in the U.K. and a top strategic choice for Interstate’s targeted expansion plans,” said Leslie Ng, chief investment officer of Interstate Hotels & Resorts. “We’re looking forward to managing this expanded portfolio with best-in-world experience, strong brand relationships and institutional-quality systems.” For more information about Interstate Europe Hotels & Resorts visit www.interstatehotels.co.uk. About Interstate Hotels & ResortsInterstate Hotels & Resorts, Inc., a wholly-owned subsidiary of a 50/50 joint venture between subsidiaries of Thayer Lodging Group and Jin Jiang Hotels, is the leading U.S.-based global hotel management company, operating branded full- and select-service hotels and resorts, convention centers and independent hotels worldwide. Interstate and its affiliates manage 387 hotels with more than 73,000 rooms in North America, Europe and Asia-Pacific, including six wholly owned hotels. In addition, Interstate has executed agreements to manage 40 hotels with more than 8,100 rooms under construction or development throughout the world. “What we have been doing over the past six years, playing games here in the UK, is really about embedding the sport into the popular culture.” He added: “When you think about it, we have got a tremendous following in the United States and are the number one sport, but it is hard to grow when you are that big. NFL International Series results 2012: New England Patriots 45-7 St Louis Rams 2011: Chicago Bears 24-18 Tampa Bay Buccaneers 2010: San Francisco 49ers 24-16 Denver Broncos 2009: New England Patriots 35-7 Tampa Bay Buccaneers 2008: New Orleans Saints 37-32 San Diego Chargers 2007: New York Giants 13-10 Miami Dolphins “Our next frontier is international. We have made a real focus of the UK being our primary investment market globally.” Pittsburg Steelers take on Minnesota Vikings this weekend, while the Jaguars will play San Francisco 49ers on 27 October. Last year Jacksonville Jaguars, whose owner Shahid Khan recently bought Premier League football club Fulham, agreed a four-year deal to play one regular-season match per year at Wembley. “We sell the stadium out every year and this year we brought two games which sold out in record time,” Parsons added. “We want to continue to play more games and nurture a young fanbase that will grow up loving the NFL. 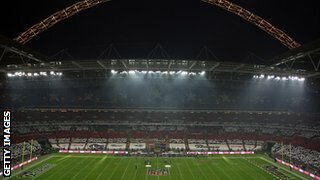 “That gives us a platform to be able to do more things in the future.” With NFL commissioner Roger Goodell mooting a third London game in the coming years, Parsons says their target is for American football to be among the five most popular sports in the UK. “Our goal is to essentially move up the rankings of popularity of sport,” said Parsons. “In the UK, depending on which measures you look at, we are inside the top 10 in terms of the number of fans that we have. “That is great and we have moved up significantly but we want to really push into that top-five position. “We think we have got a great sport which, by its very nature, provides incredibly close games, a tremendous play-off system and a world-famous Superbowl. The same rate will also apply for the United Kingdom s fixed network. The international call bundles offer also comes with free bonus data on the bundle purchased. The offer will give Orange pre-paid customers across the country increased talk time with family, friends and business partners at affordable rates. Company CEO, Mickael Ghossein, says the company is committed to delivering even better rates for its customers, allowing them to save on cost, talk more for less and also access the Internet more affordably. We are constantly tailoring our offers with our customers in mind and aim to deliver more value and satisfaction to them, as evidenced by this call rate offer that is the lowest in the market, says Ghossein. To activate the offer, Orange subscribers top up from KSh 100, they then dial #123#, select option 3 for offers and select option 3 again for international bundles. Each bundle has a 30 day validity period from the date of purchase. Once the bundle is over, the subscriber needs to purchase another bundle as this offer is not renewed automatically. If not, any international call made thereafter will be charged at the existing Pay-As-You-Go rates, which vary from country to country. In addition, the offer that runs up until December 15, 2013, also comes with free access to Wikipedia and Facebook Zero. Recently, Orange was rated as having the cheapest prepaid product among the country s four mobile operators. This announcement, through a study done by Research ICT Africa, commissioned by the Organisation of Economic Co-operation and Development (OECD), showed that in the second quarter of 2013, the company s retail basket stood at KSh 242.00, compared to KSh 363.60 for Safaricom, KSh 290.64 for Airtel Kenya and KSh 313.01 for yuKenya. (c) 2013 Euclid Infotech Pvt.